Fort Totten Transfer Station, how do I love thee? Let me count the ways. Though I criticize the government of DC, from time to time, there are many things I love about living in the city. At the top of that list is not the gorgeous architecture, nor the Metro, nor the monuments, nor Rock Creek Park, nor even Target. No, it is the giant mountain of trash that resides in Northeast Washington, in smelling distance of Catholic University. 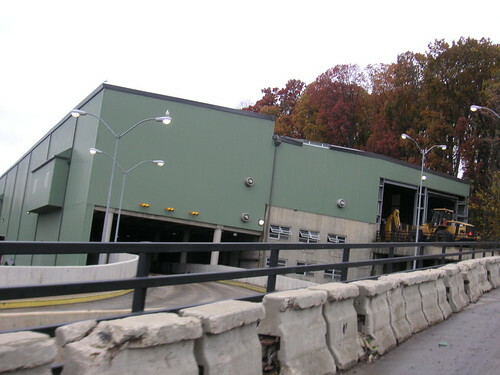 It is the Fort Totten Transfer Station. Many, perhaps most, live their lives never having set foot on the hallowed ground at 4900 Bates Rd, NE. To those, I say, what you cannot see still serves you daily. Because the refuse of your existence, the by-products of your modern life, most likely rest in this purgatory before being delivered to their final resting spot. Probably in New Jersey. But I embrace this place, I choose to interact with it at a personal level, to commune with the compost. In fact, I went there Saturday. Three times. The glory of Fort Totten cannot be understated. Where else in the world can one load up thier pickup truck with all manner of debris, be it trash or treasure, rubble or rubbish, and liberate your home from its shadow? It's remarkably convenient location is barely 8 minutes' drive from my home, yet in this short time I can make a truckload of trash vanish forever. The old couch that festers in your backyard, the bags of construction debris from the never-ending home improvement or housecleaning projects. All those things can become a memory with one short trip to nirvana, northeast. At Fort Totten you will be greeted by the smiling sanitiation workers who, upon inspection of your DC driver's licence, the passport to perpetual purging pleasure, will point you to a pile for perusal and pillaging. Oh yes - the transfer station giveth as it taketh away. As I was unloading one of my three loads of rubbish this weekend, I salvaged a perfectly functional security gate, needing only minor repair, callously dumped by someone who didn't see its inner beauty. Unfortunately it didn't fit the door where I intended to use it. But no matter, because I will surely be there again sometime in the not-too-distant future. And then I will return the gate, perhaps for collection by some other trash-picker, or perhaps for it's final demise. To all those who have never known the pleasure of watching a truckload of trash disappear from your life forever, I can only say, go. Now. To Fort Totten. Take your trash, your tree limbs, your old furniture. 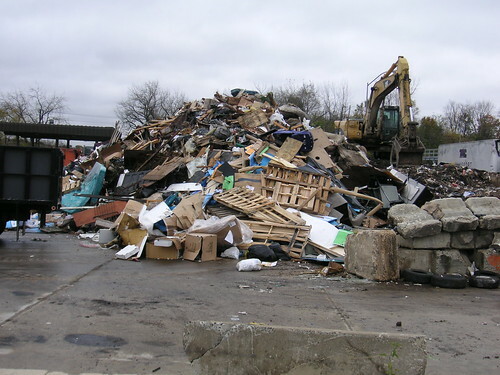 Take that junk that fills your basement or your backyard, and bring it to the place where it belongs. Fort Totten calls for your garbage. Its appetite is insatiable. i didnt know they giveth! whats yer gate look like? It's a white iron gate with some some grape leafy looking decorative stuff. It looks like its set up for storm windows or screens too though they were unfortunately not included. The only thing wrong with it was that one of the decorative pieces was broken, but I know a welder who can easily fix such things. It was too big unfortunately. You only tell me about the things you TAKE to the dump- I didn't know you could bring things BACK from the dump!! The one drawback I can think of to visiting there is four-legged-critters. Did you see any? I cannot abide those with their long, bald tails. Eeeuuuw!!! Fab post! You're too young to have a hoarding problem... you should see my place. Have been meaning to get over to Totten to try out the electronic disposal aspect of it. Just got back from FTTS -- I love that place! Repent, for the end is near! Beware the Facebook Scam. And The Cure.